Finally got my stolen stereo replaced in the Tacoma with a JVC KD-R810 head unit. Cost a bit more than my old unit, but for an extra $50 bucks I get built in Bluetooth and iPod/USB integration. I’ll do a full write up on it later, but I just have to say it is nice driving to work with some sort of audio entertainment. The Tacoma’s stock receiver does not have an auxiliary input and there’s no way I was going down the FM transmitter route so it was time for a head unit upgrade. 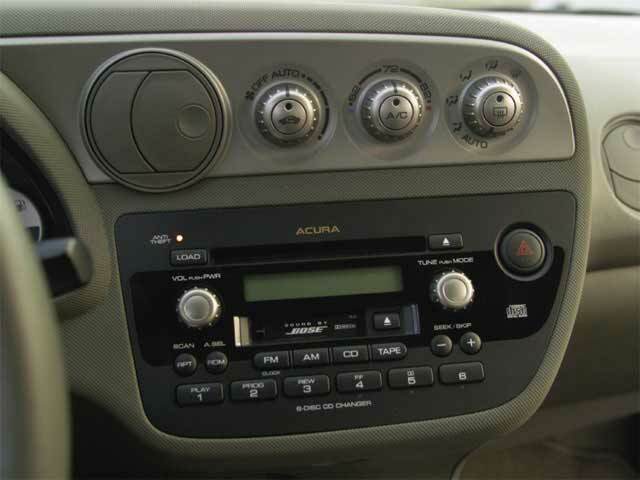 Here’s a quick look at my installation of an aftermarket stereo/radio/cd player and auxiliary input for an mp3 player, Ipod or any other audio playing device in my Tacoma. 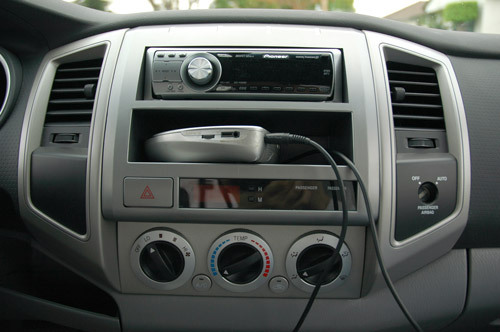 The install isn’t too bad so if you want to breath new life into your Tacoma’s stereo on the cheap then this is a great little project. 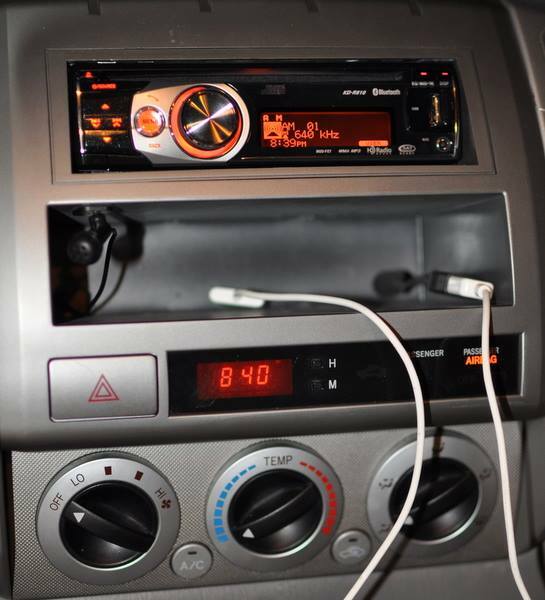 Dash Kit Info: I got the Scosche TA2052B Single Din from Amazon, there’s also a double DIN version. Head Unit Info: I got a Pioneer DEH-P4800MP, but it is discontinued now which is too bad since the finish matches the dash kit almost exactly. I keep looking, but haven’t found anything with as good of a color match. If you want to buy new, these Pioneer units have a bit of the lighter silver color and have received good reviews: Pioneer DEH-P5000UB , Pioneer DEHP4100UB, Pioneer DEH2100IB. This is the stock stereo I had to work with. 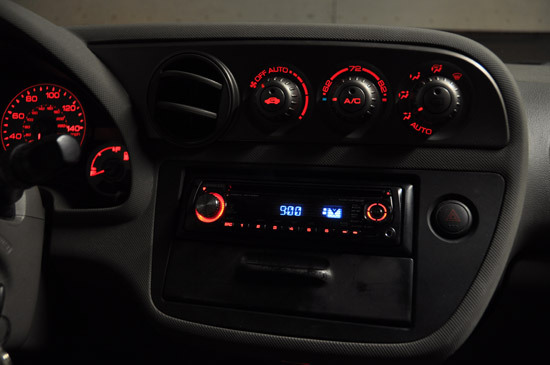 The trend has been towards completely integrating the stereo into a car’s dash, it looks great but as soon as you want to install an aftermarket stereo in you might be stuck. 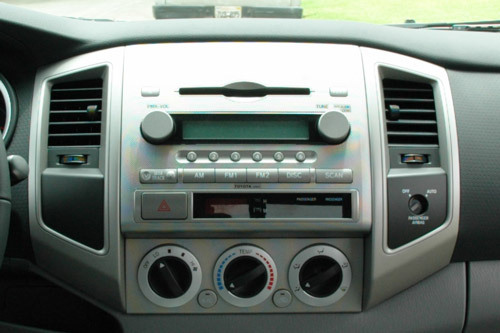 The aftermarket dash kit is color matched to the silver around the vents. Step 1 – Rip out climate control, unbolt and remove dash and stereo, unhook everything. 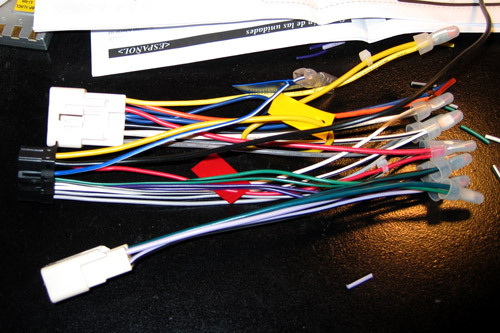 Step 2 – Wire up the wire harness so you don’t have to cut any of the factory wiring. 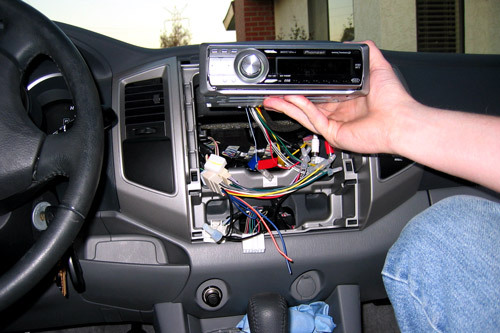 Step 3 – Hookup stereo and test to make sure everything works before putting the whole thing back together. 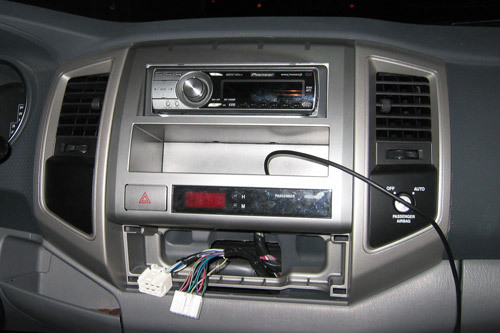 Step 4 – I’ve got everything in and just need to stick the climate control panel back on. Getting the head unit and hazards/clock panel into the replacement dash was the most time consuming part of the whole project. 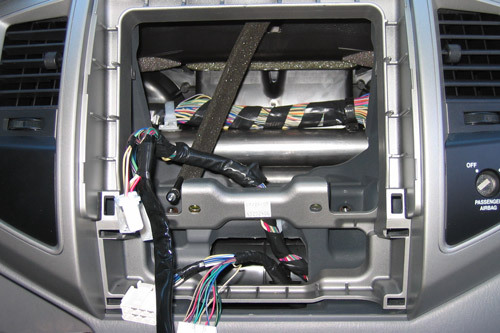 First I couldn’t get the hazards panel out of the stock dash but managed to pry it out after an hour. Secondly, the installation instructions for the dash kit were pretty brief, I guess you can consider a diagram and a few unintelligible sentences instructions. At this point I had also drilled a hole in the back of the pocket to feed the cable for the auxiliary input through. Finish – With everything put back together I actually like the look of the replacement dash kit more than the original bumpy texture. Audio quality is much better after a little EQ’ing and I can now hook up an Mp3 player. New speakers would be a nice upgrade, but the new head unit really helps the stock speakers come alive. Not a terribly difficult project and I’m glad I did it myself instead of paying an installer a good chunk of change to do it. I probably got lucky since most dashes aren’t this accessible and easy to work with.